On the similarly titled album Control Data Mark Stewart, the enigmatic former lead singer of The Pop Group, wrestled with the question of whether data controls you or do you control data in a career where he has continually sought to expose surveillance techniques and other nefarious actions of government but nowadays it's not just the state that's watching us it's private business too. Total Data Control from Compactor focusses on the impact of digital technology on individuals and citizens. Services, such as Google and Facebook, monitor the behaviour of users, using this behavioural data to predict our future actions. Sometimes the effect seems innocuous when algorithms force feed us targeted advertisers. Other times the impact is altogether more insidious and frightening such as the data sharing used by companies such as Cambridge Analytica to purportedly affect election outcomes. We might be living in the digital age but we are also, as some commentators have pointed out, now unwillingly part of a surveillance economy where our data is the currency bought and sold in order to make a profit. Total Data Control, as described by its label Phage Tapes "turns the lens and microphone around on Surveillance Capitalism, the commodification of consumer information." Compactor is just as faceless as its subject matter. Compactor is not a person. Just like The Psychogeographical Commission associated project The Nothing Machine whose recordings are created by Technicians, Compactor has no members. Compactor is an interconnected set of mostly obsolete machinery that is manipulated by The Worker, an employee of Waste MGT. Whoever they are though on Total Data Control they bring the noise rendered through slabs of dirty, shuddering beats and computerised processing. This is a clever album with a clever concept at its heart sculpting rhythm, noise and beats saturated with reams of data processing and manipulations. 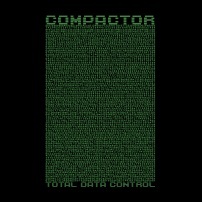 Total Data Control sets out its intent on 'Pervasive Intrusion' bustling to blasts of dirty, distorted beats overlaid with a wild amalgamation of processed computerised sounds. Rhythmic noise with processed distortion, it's a fine slice of high density malfunctioning. The processed rhythmic noise of 'Digital Footprints' unleashes spiralling waves of noise and manipulations. Its heavily distorted beats rendered with processed squelch, almost reveal a dance track as if created by machine intelligence based on a user whose listening habits stretch from Autechre, Aphex Twin to Merzbow. 'Unencrypted' revolves around a rhythmic tick, shuddering with distorted beats, reconfiguring later with even heavier blasts and bursts of industrial distortion punctuated by manipulated frequency squelch. The bass tones and stuttered, beaty discord display an IDM element but it's not like Compactor find a groove and stick to it, 'Unencrypted' continually evolves until the whole thing reverberates to metallic percussion and overheated chaotic noise processing. The most impressive track on Total Data Control and perhaps its centrepiece is 'Keylogger' and it is, uh, something of a masterstroke. Lunging into blasts of bass shudders from an opening patter of keyboard taps, it moves from rapid processing as malicious spy programs record your key presses into a passage of chugging sequences before it becomes a brutal mindfuck. Those bass shudders keep beating, oozing frequencies, distortion and noise slips as it slides into a torrent of pulverising noise. There's little let up as it almost segues into the revving electronic distortion of 'Manipulated Newsfeed'. Saturated by splices of sped-up algorithmic manipulations, signifying the torrent of tailored information overload we're subjected to online, coming too fast to fully comprehend or understand. Total Data Control doesn't just focus on the obvious online world. And why should it since Google, without our permission have photographed all our streets making them viewable online to all worldwide users. That sense of paranoia runs through 'Location / Identification', pounding to clipped noise tones, acting as some sort of pulse, amidst reams of computerised processing, distortion and jabbering keys as it processes our personal data from our phones, recording our shopping habits, our travels and even, no doubt, scanning our faces wherever we are. Yes, we're being watched and its not just from our digital devices. Rhythms skitter and scuttle amidst flickers of distortion and airy noise shudders, as 'Security Camera Stream' grinds its rapid processing, naturally, capturing the daily grind as we go about our day-to-day business in the real world. There's no escape from this pervasive data capture. The final track, 'Listen Learn Predict' is immersed in communication effects from an array of diverse equipment including telegrams and modems. Their bleeps, chimes and tones, processed whirs and whirls integrated into the heaving pulsing foundation, scattered with noise effects extracting our data patterns into behavioural predictions in an attempt to elicit change.